"What was the Johnsen's BLUE TOP DRIVE-IN ?" A question often asked by the under 30 crowd. 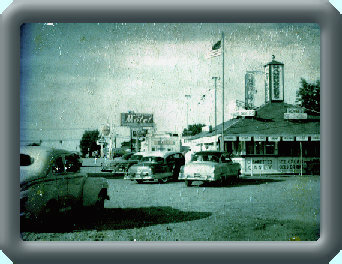 Well some called us a "Legend" others called us a "Landmark"
It's an outdoor restaurant that lets the drivers of cars and trucks (since 1936) to eat under a canopy in the comfort of their own vehicle (SINCE 1964). The sandwich's are huge and the shakes are great. The outside servers are called "Carhops" a throw back to 1920's when cars had running boards, The server would actually "Hop" on to the vehicles to take the drivers order. The Blue top has inside seating but most people still enjoy having a tray put upon the window of their vehicle. Picnic tables are available and inside seating for about 35 patrons. Blue Top is known for their above average size burgers. We cut them in half because "2 people can get their fill on 1 Burger." Our most popular Burgers are the CRUISER which weighs in at about 1/2 lb. The "BIG BEN" named after Ben Johnsen "Not the Clock" is a double Cruiser with extra American Cheese. The Super Bacon CheeseBurger is a Cruiser with Bacon. Sure we have Hot Dogs, Rings, Frys, Breaded Mushrooms, etc. But we also have BEEF Sandwichs and Ham Hoagies. Our Pride and Joy is our ROOT BEER That we make in our Kitchen. We also have flavored Cola's Vanilla, Cherry, and Rum made from a Secret Recipe. We make it fresh to order, burgers don't sit a for 1/2 hr before being served to you and we don't stretch the hamburger by mixing in bread crumbs. We grill our Burgers, We do not Char Broil them because we believe it is healthier. Our Premium Burgers are cut in half, "Because their large enough for 2." Our Shakes are heavier than others because we don't pump a lot of air into the ice cream mix. You are buying a shake, not foam at the Blue Top. Our drinks are served with "shaved Ice" not cubes. Our Root Beer is made in the kitchen And remember you will be served by a Real Smiling Carhop. That on April 18, 2001, The JOHNSEN'S Blue Top was awarded the Half Century Business Award for outstanding contributions to the economic growth and prosperity of Indiana. Given by Lieutenant Governor Joseph E. Kernan. That since the late 80's we have helped countless non-profits and Youth Groups raise money at the Blue Top Drive-In by promoting Car Washs. In 2009 One Hundred and One Car washs were scheduled which raised aprox. $30,000.00. From 2010 to 2012, 90 to 110 car washs were held each year!